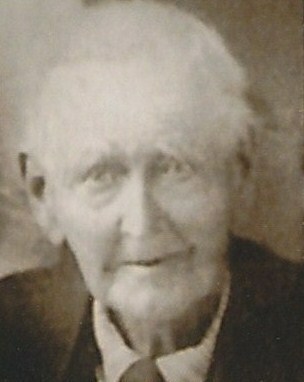 BAILEY REID (REED) (1806 – aft 1840) was born in Oglethorpe County, Georgia, the son of Jacob Reid and Elizabeth (Mary) Staton. Bailey has been a difficult ancestor to chronicle. What we do know of him comes mostly from family folklore, and a smattering of historical records. It appears from tax and census data that Bailey lived with or near his parents and siblings in Oglethorpe County throughout his youth and early adulthood. Those were challenging days, likely primarily spent working as a laborer in the cotton or tobacco fields either on his father’s farm or on land owned by the larger plantation owners in the area. 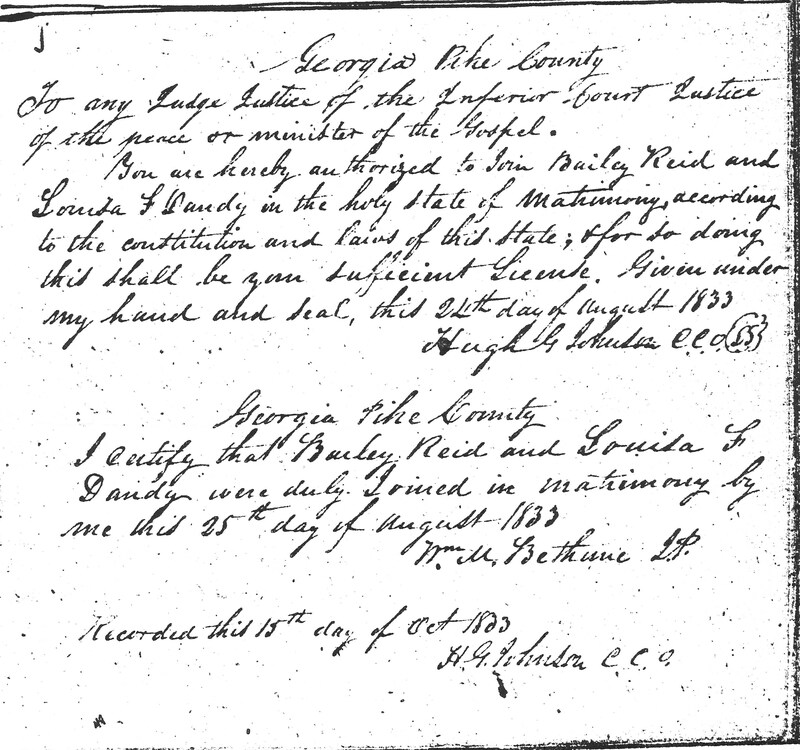 Bailey was 20 and still single when he participated in the 65th day’s drawing of the 1827 Georgia Land Lottery conducted on May 21, 1827 in Milledgeville, Georgia. The lottery records indicate that Bailey was given one draw, confirming by rule that he was a non-orphaned bachelor, 18 years or older, a 3-year resident of Georgia, and a citizen of the United States in good standing. 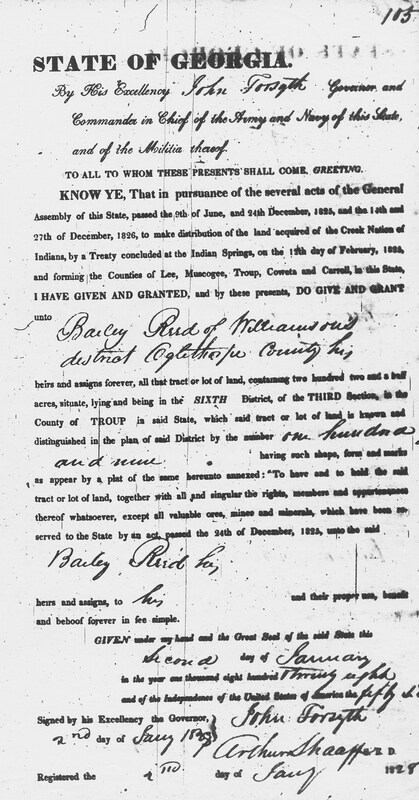 In 1825 the Indian Springs treaty was made whereby Georgia secured from the Creek Indians the vast tract of land lying between the Flint and the Chattahoochee rivers. Troup County, one of the five made from this territory was opened for settlement in 1827. Many stories had gone into Greene, Wilkes, and other older counties, of the fertile soil, the virgin forests, the wild game, and the friendly Indians, so many settlers traveled by wagon, or on foot, into this new country, and came into possession of land by a lottery grant, or by purchase from some fortunate grantee. These early pioneers began building sturdy log houses, cutting the logs from the forest and hewing them with a broad axe. Some of these early houses were built with lofts reached by ladders in order that the women and children could escape from wolves while the men were working in the fields and forests. These early settlers were soon joined by other pioneers, many from Virginia and the Carolinas, for after the Revolution many pioneers were seeking land grants, wherever they could be obtained. From September of 1824 to December of 1825, Marquis de LaFayette was a guest of the American nation, and during this time for two weeks he was the guest of our Governor Troup of Georgia. So great was the appreciation of his services to the nation and the admiration of his ideals, that when this small settlement decided to incorporate the community, in a town meeting called for the purpose of naming the town on motion of Julius C. Alford, it was named by a unanimous vote LaGrange, in honor of the estate of LaFayette in France. The selection of the site for the county town, or county seat, devolved upon the five judges of the Inferior Court: James Culberson, Samuel Reid, James Maddux, John E. Gage, and Whitfield H. Sledge. Samuel Reid, who lived near Whitfield Crossing, favored a site near Mountville; John E. Gage, who was interested in the promotion of the town of Vernon on the banks of the Chattahoochee River, favored Vernon as the county town. The Inferior Court being unable to agree on either site finally agreed to place the county town about half way between the two contesting communities, and the final selection was land lot 109 in the 6th land district. This lot was drawn in the state lottery at Milledgeville by Bailey Reed, a citizen of Oglethorpe County, on May 21, 1827, who sold the lot to Buckner Beasley for $300.00 on February 15, 1828, and Beasley in turn sold it to John Pinckard for $500.00 on February 28, 1828, and Pinckard sold it to the Inferior Court of Troup County for $1,350.00 on March 5, 1828. In 1828, soon after land lot 109 was acquired by the Inferior Court, it was decided that a courthouse should be built on the site. The courthouse remained on that site until its removal in 1936. That site has evolved into a public park known as Lafayette Square where a statue of Marquis de Lafayette now stands. In 1828 or early 1829, not long after selling land lot 109, Bailey married Hannah Washington Williams in Oglethorpe County, Georgia. Their first child of record, a son, was born 1 Dec 1829. Rather by coincidence, knowledge of the ultimate disposition of land lot 109, or by some other source of inspiration, Bailey and Hannah chose to name their new-born son Marcus D Lafayette Reid. Not long after son MDL’s birth, a second child was stillborn in 1832. Life in Oglethorpe County, Georgia at that time was particularly difficult. Disease was prevalant, cotton farming was poor, and opportunities for labor were somewhat scarce. According to family sources, Bailey left Hannah and MDL behind in Oglethorpe County in early 1833 to join in the pursuit of gold in the hills of Georgia and beyond. Bailey had enjoyed success in the 1827 Land Lottery, and perhaps he saw similar opportunity for success in the pursuit of gold. Sadly, it is reported that he died sometime thereafter in either Georgia or California while in that pursuit. Indeed, stories of the 1830s Georgia Gold Rush and it’s resultant riches and ruin are legendary, as are those of the similar rush to California in the 1840s that followed. One thing is certain. Bailey never returned home, as confirmed by his absence in subsequent tax and census records of Oglethorpe County. Hannah and MDL did remain in Oglethorpe County, apparently living on the Williams farm with Hannah’s widowed mother, Lucy, and her brother Harrison as evidenced in the 1850 Census Record of Oglethorpe County. Historical records of the period offer a possible contrasting view of what may have become of Bailey after he left Hannah and MDL in Oglethorpe County. Bailey’s older sister, Pensy Reid Vaughn, and brothers Reuben and Freeman are known to have lived in Pike County, Georgia in the 1830s. Vital records of Pike County also list the marriage of a Bailey Reid and Louisa F Dandy on 25 Aug 1833. A Bailey Reid also appears on Pike County tax records in 1835, 1837, and 1838. 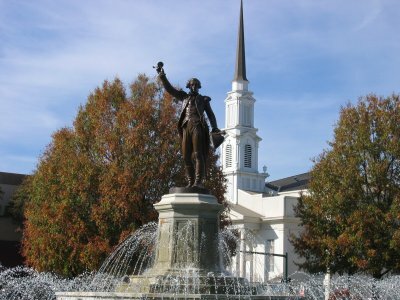 The Bailey Reid living in Pike County, Georgia in the 1830s may, or may not, be the son of Jacob Reid, but his proximity to other known Reids living in the same area, as evidenced by tax records, does make for a compelling argument that they are one in the same. Assuming that Bailey left Oglethorpe in early 1833 and married Louisa Dandy soon thereafter, only two logical conclusions can be drawn. Either Bailey and Hannah were divorced when Bailey left the household, or Hannah and MDL were never aware of the true fate of their husband and father. 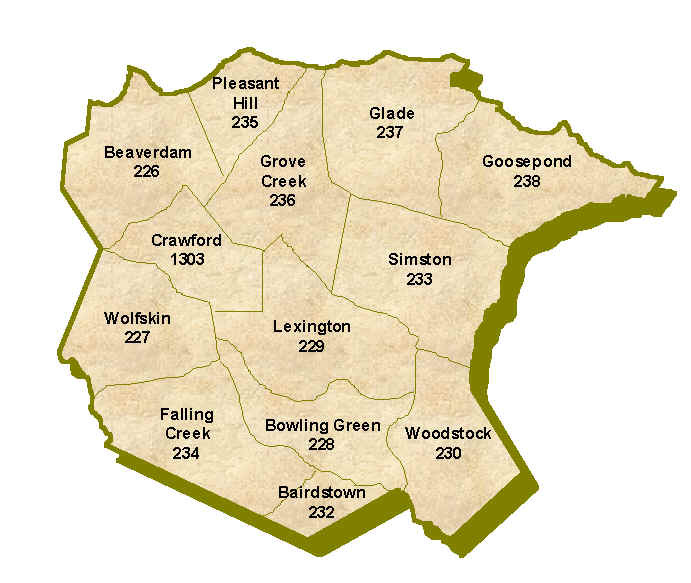 We have attempted to track Bailey and Louisa beyond their marriage and appearance in Pike County, Georgia in the 1830s. A Bailey Reid appears in the 1840 Benton County, Alabama census with a slight age difference, but no viable historical records for Bailey or Louisa have been found thereafter. 21 May 1827: Draws land lot 109 in 1827 Georgia Land Lottery. 15 Feb 1828: Sells land lot 109 to Buckner Beasley for $300.